Tonight, the Nashville Predators will have their final home game of the regular season against the New York Islanders. The Predators have clinched their spot in the postseason with the Kings losing to the Coyotes. Their sights are now set on seeding for the Stanley Cup playoffs. With this home finale, the Predators will look to move up into the seeding they desire. The most desirable spot would be the #3 seed against the Minnesota Wild. The Blues, currently in third, have a two point lead on Nashville and have one game more to play. The other option would be to win the first Wild Card spot, which is currently held by the Calgary Flames, who are currently one point ahead of the Predators. If Nashville cannot pass the Blues and the Flames, they would be in the second Wild Card, which would mean facing the Chicago Blackhawks. Needless to say, these last three games will be interesting to see what transpires moving into the postseason. The Islanders come into Nashville trying to get into the Eastern Conference wildcard race. For the Islanders, winning in Nashville has been a tough task, as the Isles are 1-7-0 in their last eight trips and are just 3-8-0 all-time in the state of Tennessee. The Islanders go into tonight’s crucial match-up six points back of the Boston Bruins for the second Wild Card in the Eastern Conference with four games remaining. They will be looking to avenge their 3-1 loss against the Predators from March 27th. If the Islanders lose to the Predators tonight, they are all but finished for this year’s postseason. Going into the playoffs, the Predators will need certain players to continue producing at a high level. Filip Forsberg is currently tied for second in the NHL with nine game-winning goals. The Predators will need Forsberg to continue to come in the clutch. To make a deep run in the Stanley Cup playoffs, a team must have a goaltender that catches fire and becomes a brick wall. 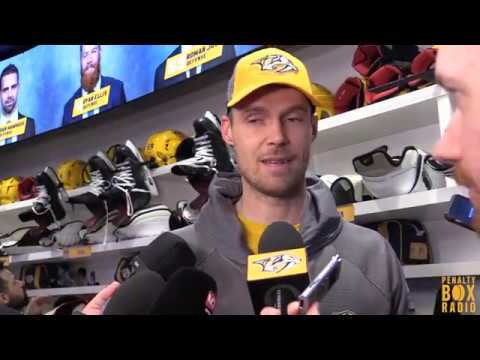 Nashville needs Pekka Rinne to be a Vezina caliber player moving forward. He is the main key to success for this team. Tonight, the Predators will close out the regular season with Fan Appreciation Night in Smashville. Be sure to catch all of the action on Fox Sports-Tennessee or you can listen live on 102.5 The Game. Puck drops at 7:00 pm!